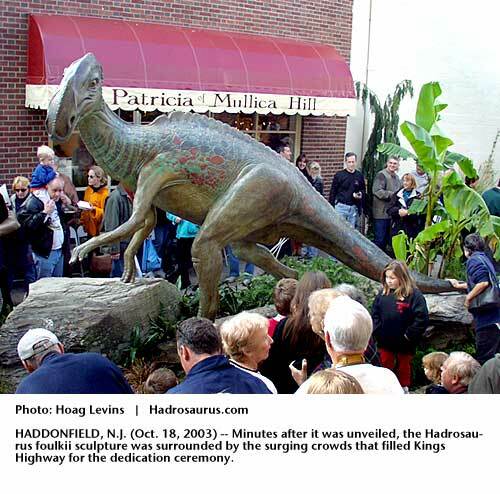 HADDONFIELD, N.J. -- In an event that turned downtown Haddonfield into a joyous celebration of paleontological history and art, John Giannotti's sculpture of Hadrosaurus foulkii was unveiled and dedicated today. Giannotti addressed the audience before the unveiling (larger photo). 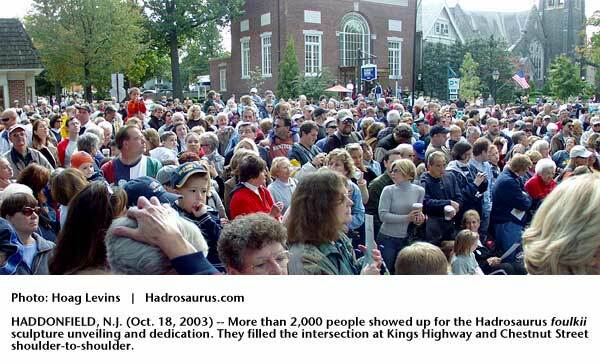 More than 2,000 people showed up for the Hadrosaurus dedication ceremony. The crowd jammed the intersection of Kings Highway and Chestnut Street (larger photo). Co-chairs of the HATCH (Haddonfield Acts To Create Hadrosaurus) Committee Jan Twitchell and Beverly Aldeghi survey the crowd from the stage. Among the more than 200 engraved pavers put down in Lantern Lane is one from their Garden Club. 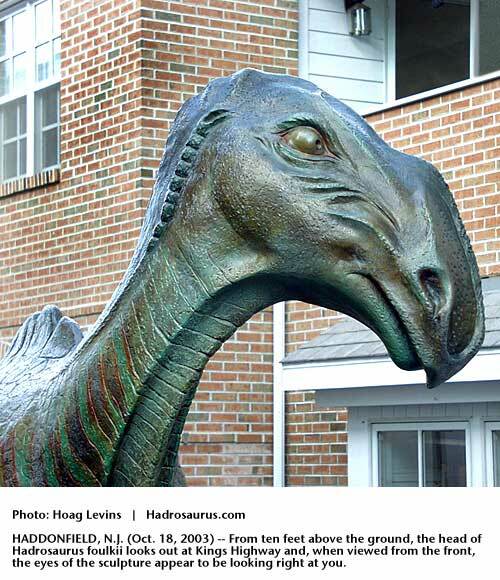 Peering down from ten feet in the air, Hadrosaurus foulkii now permanently gazes out on Kings Highway (larger photo). Mayor Tish Colombi enjoys a light moment as she laughs at a dinosaur joke from the stage. 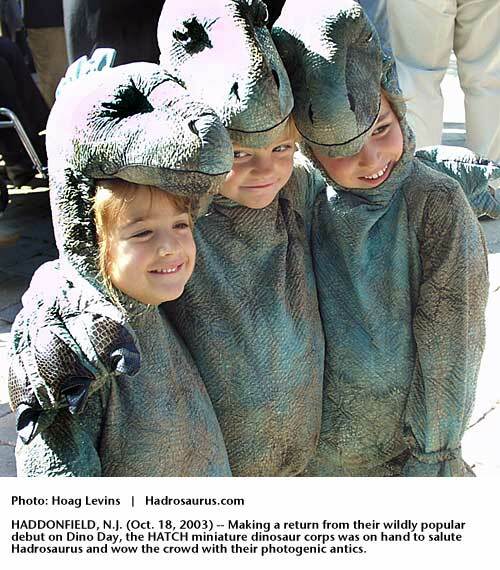 In a return performance after their debut appearance at April's Dino Day, the HATCH miniature dinosaur corps delighted camera-carrying members of the crowd (larger photo). A contingent of the Foulke family, the descendants of William Parker Foulke who discovered the fossil near Maple Avenue, was on hand for the day. Here, left to right, are Pat Gunton, whose great-great grandmother was Hanna Foulke-Rhodes; Bruce Foulke, chairman of the Foulke Family Reunion association; and Sid Foulke, vice chairman of the association.